Megiddo is mentioned several times in the Old Testament, and once in the NT (Rev. 16:16). In the Old Testament, nearing the close of the kingdom of Judah, good King Josiah (r. 640-609 BC) was mortally wounded there in battle by Pharaoh Neco of Egypt, who was en route to Carchemish to war against Babylon. 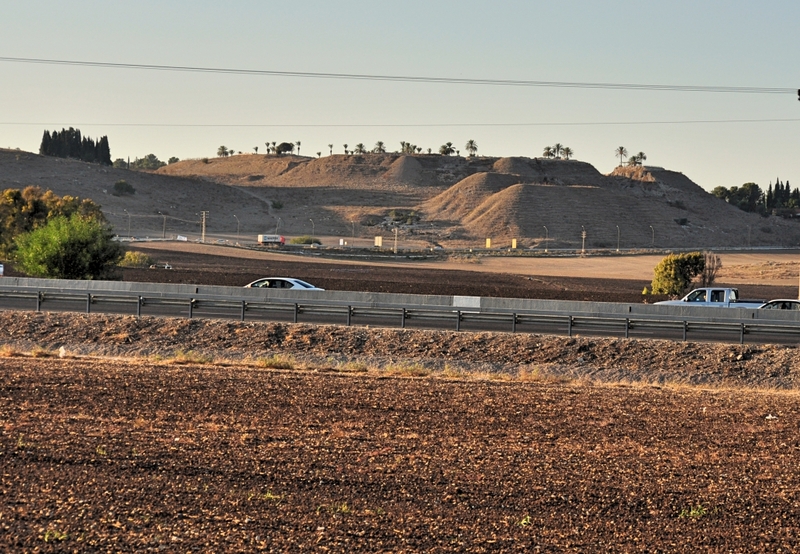 The international highway, the Via Maris, connected Egypt to Mesopotamia, so Neco was on that route, which passed through the strategic site of Megiddo. However, Josiah would not turn away from him, but disguised himself in order to make war with him; nor did he listen to the words of Neco from the mouth of God, but came to make war on the plain of Megiddo. The archers shot King Josiah, and the king said to his servants, “Take me away, for I am badly wounded.” So his servants took him out of the chariot and carried him in the second chariot which he had, and brought him to Jerusalem where he died and was buried in the tombs of his fathers. All Judah and Jerusalem mourned for Josiah. Then Jeremiah chanted a lament for Josiah. And all the male and female singers speak about Josiah in their lamentations to this day. (2 Chron. 35:22-25, NAU). Tel Megiddo in distance. A portion of the “Plain of Megiddo” or the “Valley of Megiddo” is in foreground. Photo by Leon Mauldin. One of the sites my group visited in November ’16 was Megiddo. 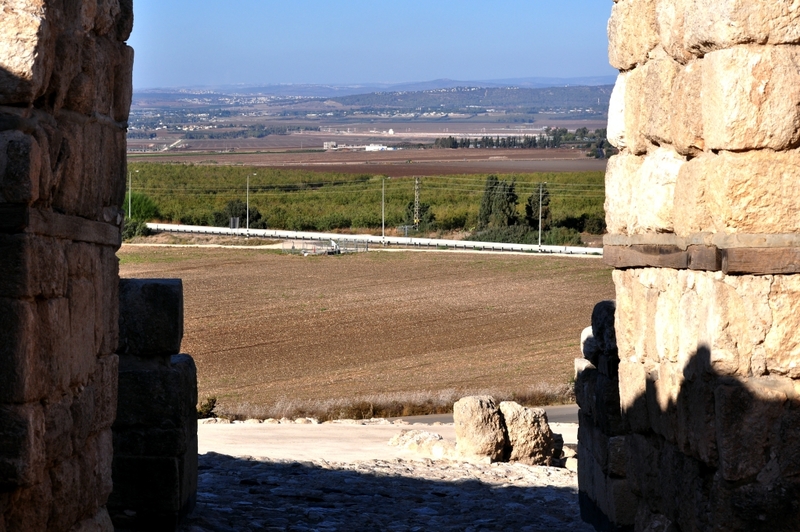 View from Megiddo through ancient gate looking to plain below. Photo by Leon Mauldin. Here is a view of some of the archaeological excavations in foreground, with another view of the plain/valley below. Excavations/view from Megiddo. Photo by Leon Mauldin. 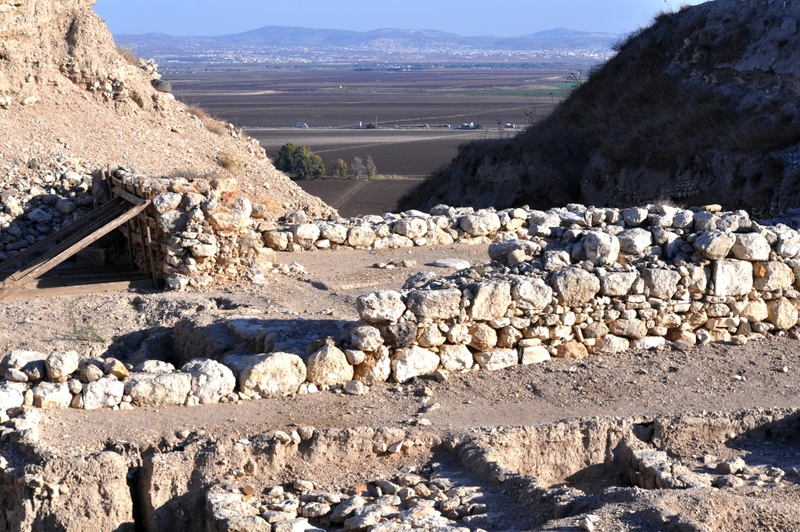 These photos help provide the setting for the texts that mention biblical Megiddo. I have made numerous posts on Megiddo; click here, here, here, here, here, and here. We recently had the opportunity to visit Bethlehem, the town where Jesus was born. In addition to Bethlehem’s being important for that reason (Micah 5:2; Luke 2:1-20; Matt. 2:1-13), this location is also significant due to the work of Jerome (Eusebius Sophronius Hieronymus). 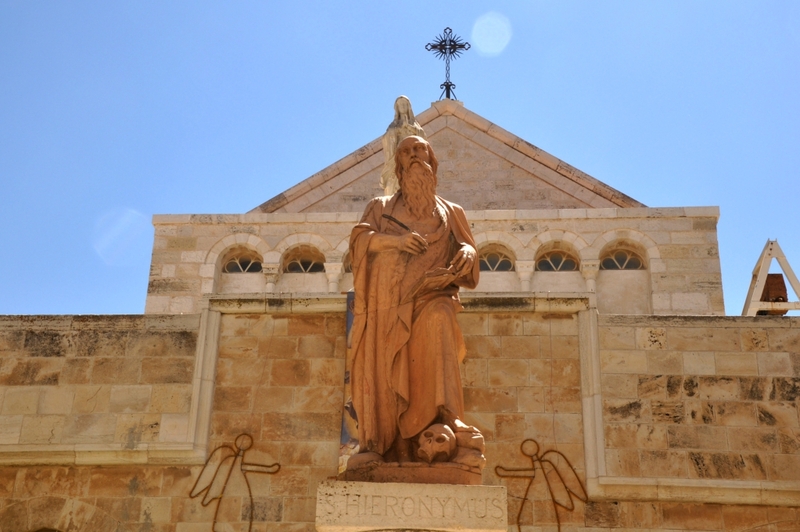 Statue of Jerome in Bethlehem, outside of the Church of St. Catherine. Photo by Leon Mauldin. Jerome was born at Stridon, Dalmatia, ca. AD 347. He is especially noted for his translation of the Bible into Latin. In 384 Jerome took up residence in Bethlehem, to be joined two years later by Paula and her daughter Eustochium. Together they made Bethlehem a great monastic centre; within this framework Jerome wrote prolifically, his most notable achievement being a new translation of the Old and New Testaments (the Vulgate) which remained the authoritative version of the Bible for Catholics until the C20. (Murphy-O’Connor, The Holy Land: An Oxford Archaeological Guide from Earliest Times to 1700, Oxford Archaeological Guides, p.233). 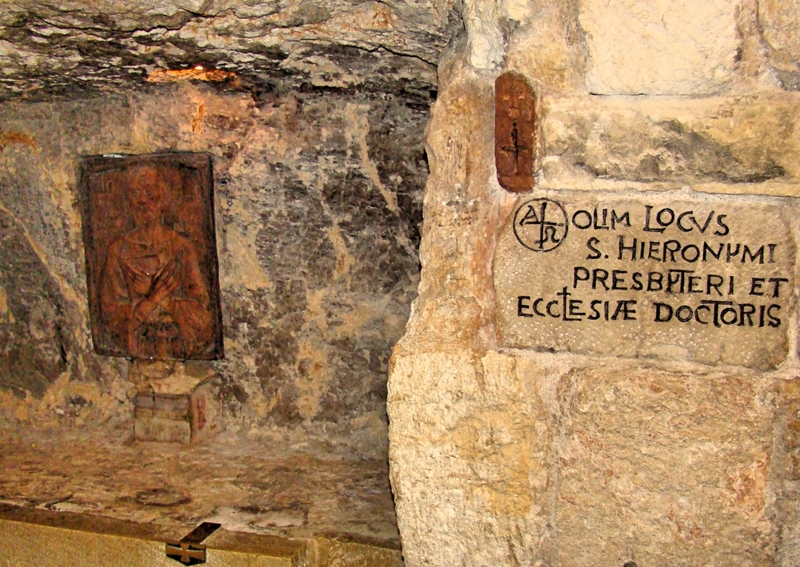 This cave is said to be Jerome’s study, where he did his monumental literary work. Jerome’s study in Bethlehem. Photo by Leon Mauldin. See Ferrell Jenkin’s article (Dec. ’08) on Jerome here. We continue to explore some of the gates of Jerusalem, as we share some our photos from our recent trip to Israel. Today’s post features Herod’s Gate. Herod’s Gate in Jerusalem. Photo by Leon Mauldin. The official name of this gate is Bab ez-Zahr, ‘the Flowered Gate’. It got its present name only in the C16 or C17 because pilgrims believed a Mamluk house inside near the Franciscan Monastery of the Flagellation to be the palace of Herod Antipas. The original entrance is in the east face of the tower. It was at this point that the Crusaders first established a bridgehead on the walls at noon on 15 July 1099. Just beside the west face of the first tower going towards Damascus Gate the channel of an aqueduct is marked by a series of irregular covering slabs. Pottery embedded in the plaster of the last repair show it to have been in use until the late C3AD or early C4. The ditch in which the present road runs must therefore be subsequent to this date, because it cuts the aqueduct. This suggests that the earliest wall on the present line at this point must be dated to the last years of Aelia Capitolina. Slightly further west the wall makes a curve inward and follows the rim of an ancient quarry which extended across the road into what is now the bus station; for details see SOLOMON’S QUARRIES (p. 162). The weight of the wall caused part of the roof of the quarry to cave in. The small walled section in the centre at ground level enshrines part of a sloping glacis of uncertain date. 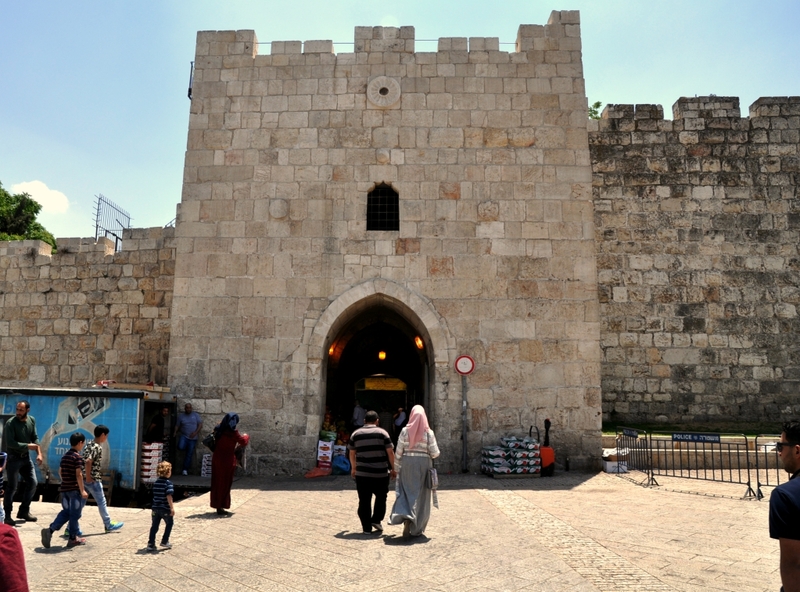 The wall of Herod Agrippa I (AD 41–4) linking Damascus Gate with the East Gate in the ECCE HOMO CONVENT (p. 35), must have turned south on the highest point to the west now occupied by the Spafford Hospital. (The Holy Land: An Oxford Archaeological Guide from Earliest Times to 1700, Oxford Archaeological Guides, p. 14). We previously posted (in 2011) on Herod’s Gate here. 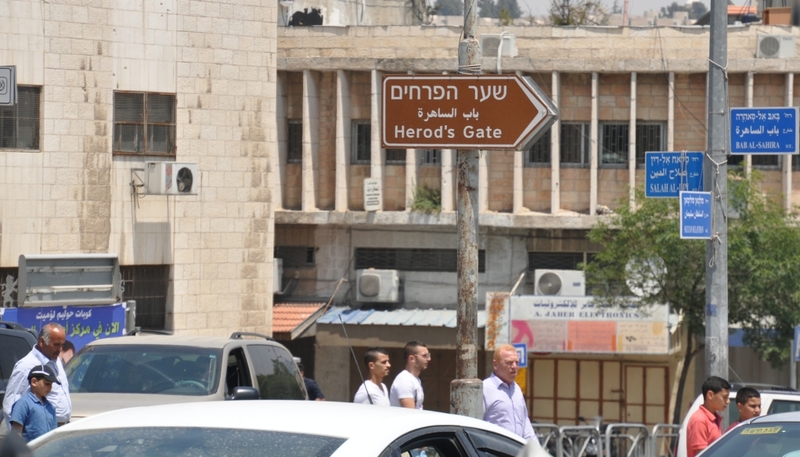 Sign pointing to Herod’s Gate. Photo by Leon Mauldin. When traveling in the Bible lands I enjoy seeing family life there, parents with children engaging in various activities–often outdoors cooking, or playing, or just out walking. On my recent trip to Israel, this young man was walking with his Dad as I was making my way toward the Damascus Gate in Jerusalem. He was about the same age as one of my grandchildren. A new friend in Jerusalem. The two caught up with me from behind, and the Dad told me his son wanted to ask me where I was from. I answered him, “the United States,” and “Alabama.” A broad smile resulted. I asked permission to take his photo, and it was granted; one of me with my new friend and one of father and son. 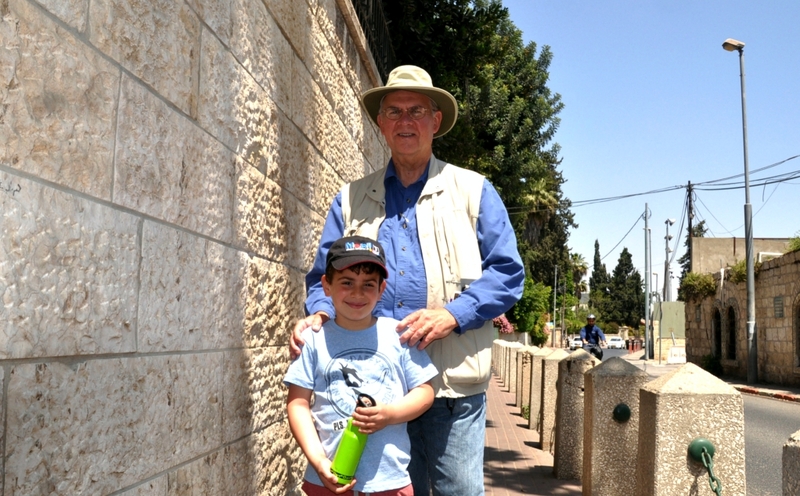 Local father and son in Jerusalem, wanting to make my acquaintance. Photo by Leon Mauldin. I gave the father my card with URL for this blog, and told him to check it out to see their photo. Damascus Gate in Jerusalem. Photo by Leon Mauldin. This entrance gate along the present north wall dramatically accents the spot that has been the main north entrance to Jerusalem for almost two millennia. R. W. Hamilton’s sounding here in 1937 and Basil Hennessey’s excavations in the 1960s; have revealed, below the modern entrance, layer upon layer of earlier gateways, reaching back through Arab, Crusader and Byzantine constructions to Roman Age foundations. The earliest certain construction here dates to Aelia Capitolina, the second to fourth-century C.E. city of Hadrian, but both Hamilton and Hennessey felt they found evidence that Hadrian’s gateway was built on foundations that went back to the Second Temple period. BAS Biblical World in Pictures. (2003). 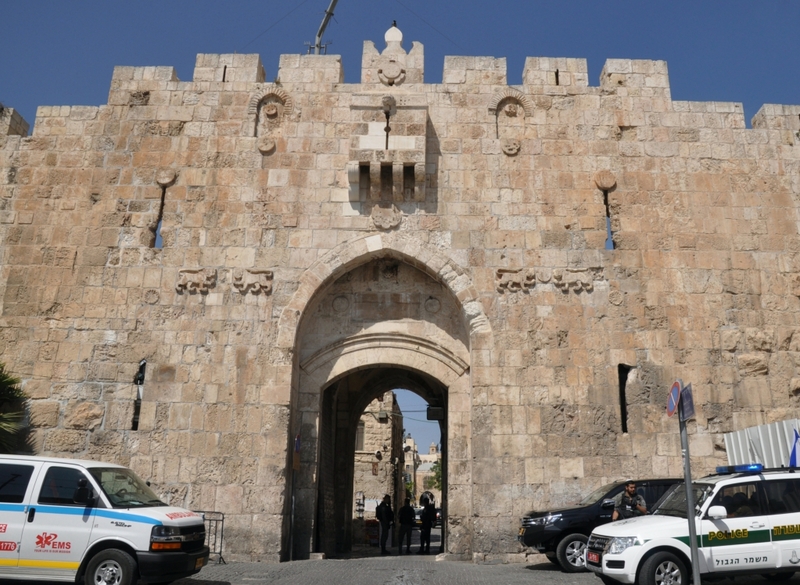 St. Stephen’s Gate, also known as the “Lion’s Gate,” is one of seven open Gates in Jerusalem’s Old City Walls. This gate is located on the Eastern Wall. It is It is called “St. Stephen’s Gate” because of the tradition that Stephen, the first martyr of the church (Acts 6-7), was stoned to death at this location just outside the city walls. 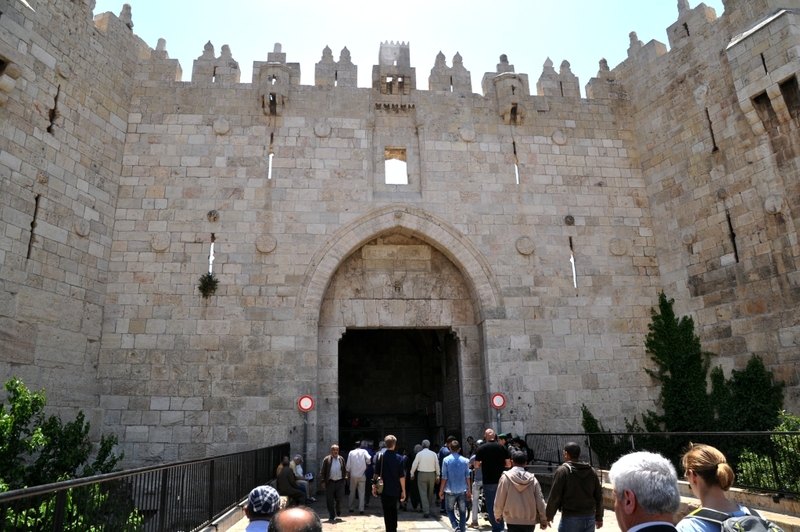 St. Stephen’s Gate, located on Jerusalem’s Eastern Wall. Photo by Leon Mauldin. “You stiff-necked people, uncircumcised in heart and ears, you always resist the Holy Spirit. As your fathers did, so do you. Which of the prophets did not your fathers persecute? And they killed those who announced beforehand the coming of the Righteous One, whom you have now betrayed and murdered, . . . you who received the law as delivered by angels and did not keep it.” Now when they heard these things they were enraged, and they ground their teeth at him. But he, full of the Holy Spirit, gazed into heaven and saw the glory of God, and Jesus standing at the right hand of God. And he said, “Behold, I see the heavens opened, and the Son of Man standing at the right hand of God.” But they cried out with a loud voice and stopped their ears and rushed together at him.Then they cast him out of the city and stoned him. And the witnesses laid down their garments at the feet of a young man named Saul. And as they were stoning Stephen, he called out, “Lord Jesus, receive my spirit.” And falling to his knees he cried out with a loud voice, “Lord, do not hold this sin against them.” And when he had said this, he fell asleep (Acts 7:51-60). Murphy-O’Connor notes, “The current Hebrew name, ‘Lions’ Gate’, is due to a mistake. The pairs of animals are in fact panthers, the heraldic emblem of the Mamluk sultan Baybars (1260–77), which Suliman’s architects set on either side of the gate to celebrate the Ottoman defeat of the Mamluks in 1517” (The Holy Land: An Oxford Archaeological Guide from Earliest Times to 1700 (Oxford Archaeological Guides, p.21). I previously posted on this gate here. Today we were able to visit Ein Yael, Philip’s Spring, located on the ancient Jerusalem-Gaza route. A number of interesting artifacts were on the site, including this sundial. 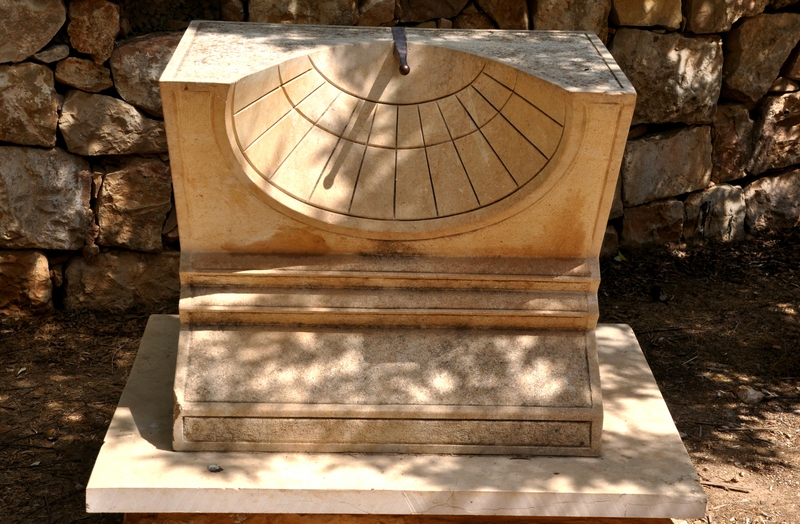 Sundial at Ein Yael. Photo by Leon Mauldin. This helps illustrate an event in the life of King Hezekiah of Judah, one of Judah’s best kings. He faithfully led the nation in very difficult times. Then he became sick and was near death. God sent the prophet Isaiah to Hezekiah with the message, “Set your house in order, for you shall die and not live” (Isaiah 38:1). Hezekiah fervently prayed to the Lord, his prayer was heard, and the Lord promised to add 15 years to his life. As a sign to confirm this promise, God said, “Behold, I will bring the shadow on the sundial, which has gone down with the sun on the sundial of Ahaz, ten degrees backward” (Isa. 38:7,8, NKJV). Whether what is intended in Isaiah 38 is this type of sundial, or another system (steps, stairway) is meant, the principle is the same. God miraculously returned the shadow to confirm to Hezekiah that He would extend his life as He had promised. Temple Mount in Jerusalem. Photo by Leon Mauldin. The very recognizable Dome of the Rock at center approximates the site of Solomon’s temple, as well as the 2nd temple, built after the return from Babylonian Captivity and vastly renovated by Herod the Great. This area is known as Mt. Moriah. This was the location where Abraham took Isaac in obedience to God’s command to offer him as a sacrifice, though He stopped Abraham prior to the actual event (Gen. 22:1-13). Years later, when Solomon built the temple, the Bible says, “Then Solomon began to build the house of the LORD in Jerusalem on Mount Moriah . . .” (2 Chron. 3:1, ESV). The temple mount consists of about 36 acres. When the New Testament speaks of Jesus teaching in the temple, or of the early church meeting in the temple, those texts are not referring to the naos (holy place/most holy place) into which only the priests/Levites could enter; the most holy place only the high priest could enter, and that only once per year on the Day of Atonement. Rather, reference is made to the hieron, the greater temple area, consisting of its many courts and colonnades, etc. You are currently browsing the Leon's Message Board blog archives for May, 2017.